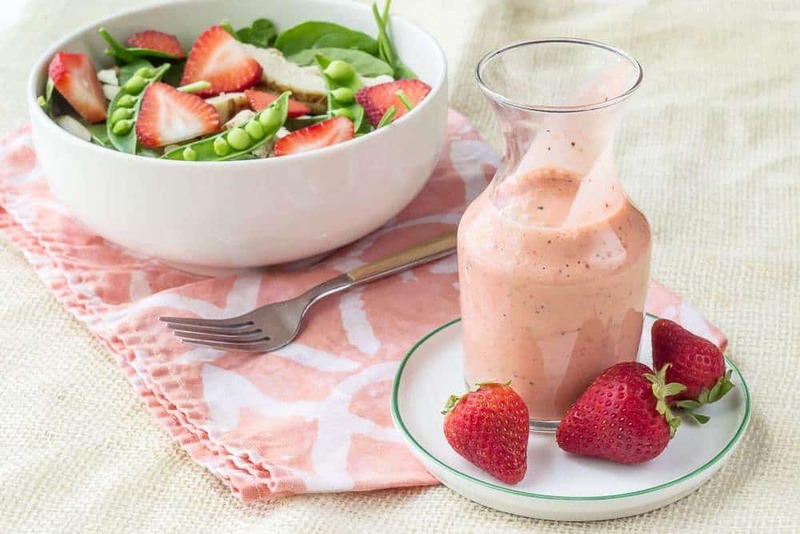 Creamy strawberry poppy seed dressing is a sweet, tangy way to top your salads during berry season. This spring we’ve yet to make it out to the local strawberry farm, but that doesn’t mean we aren’t eating tons of berries. We’re eating as many as we can handle, and right now, we can handle a lot. Most of the time the fruit doesn’t even have a chance of making it into a recipe like chocolate covered strawberry cupcakes or strawberry doughnuts. Wash, stem, eat, repeat. Not a bad way to spend some time with your kids, eating strawberries. Strawberry season does come earlier here than in other parts of the country, which is both good and bad. When they show up here, it makes me think back to all those years up north, when right about now we would be wondering if we could actually put away our winter coats. No winter coats in sight here, thankfully. (Really, I can do without any more birthdays with snow.) Instead we’ve been putting in lots of sunlit hours in the yard, trimming trees, pulling weeds, and prepping the garden for sale time. Do you think we’d get quicker buyers if I promised them some homemade meals? Or at least a bottle of these strawberry poppy seed dressing? Salads are pretty much all I eat for lunch right now. It’s hard not to, when we are always getting beautiful lettuces and crisp pea pods in our CSA delivery. While a lot of the time I make the same salad over and over out of ease, the dressing itself changes a bit depending on one or two salad ingredients. And when strawberries are involved, I gotta switch from my usual soy-ginger dressing to something fruity. This strawberry poppy seed dressing is fairly similar to my blueberry vinaigrette, but has the lovely sweetness of strawberries. Poppy seeds add just enough nuttiness without turning the dressing into a gritty mess. If you have an immersion blender, this recipe will be a cinch to make, but you can also use a blender. Store leftovers in the refrigerator, and if it separates, give it a quick shake before pouring onto your salad. Put all ingredients in a blender or blender cup. Blend until completely smooth. Serve over salad, chicken, or pork. That dressing looks so pretty! (I know) And the salad looks bright and delicious too.